Background : Mela is a sanskrit word meaning ‘gathering’ and is used to describe festivals in the Indian subcontinent.The Scottish Mela festivals are multicultural arts festivals that, while having their roots in South Asian culture, can now best be seen as celebrating wide diversity of cultural life in Scotland, featuring dance, music, crafts, food and fashion, not just from South Asia, but from all over the world. There are two annual Mela festivals in Scotland: one in Glasgow and one in Edinburgh. 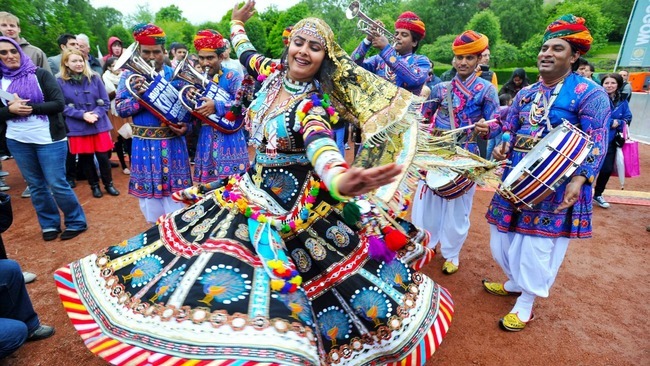 Glasgow Mela is the highest profile annual multicultural music and dance festival in the west of Scotland. It is now organised by the Scottish Academy of Asian Arts and takes place in Kelvingrove Park in early summer. The Mela was set up in 1990 when Glasgow was European City of Culture and has grown from being an indoor event at Tramway to an outdoor extravaganza. In 2007, the attendance at the one day festival was estimated at over 50,000 (http://www.glasgowmela.org.uk/pages/history.html).